My latest book is out! 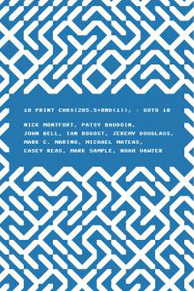 It’s called 10 PRINT CHR$(205.5+RND(1)); : GOTO 10 and it’s about a one-line Commodore 64 BASIC program. I wrote it with nine other authors, but it’s not an anthology; we write in a single voice collaboratively, producing a monograph-like text. You can buy it in a beautiful hardcover edition, designed by one of the authors, Casey Reas, and published by the MIT Press. Or you can download it as a free PDF under a Creative Commons BY-NC-SA 3.0. If you buy the book, note that all the royalties are donated to PLAYPOWER, a non-profit organization bringing learning games to the developing world thanks to a $10 TV-computer that runs on the 6502 microprocessor, the CPU also used by the C64.